The City of Philippi published a “Call to Arms” in 1988 to plan for an annual Blue & Gray Reunion beginning the first week of June in 1989. This began a 28-year tradition providing a four-day weekend filled with activities commemorating the First Land Battle of the Civil War which was fought in Philippi on June 3, 1861, says Chairman Ed Larry. One of West Virginia’s premier commemorative Civil War events, the 29th Blue & Gray Reunion will be held May 31 to June 3rd, 2018. The Barbour County Historical Museum greets up to 4,000 visitors a year between May 1st and November 1st said volunteer Wade Alexander. “Visitors frequently come as part of a tour package that might include stops at Adaland Mansion and other historical sites in the region. Coaches stop at the museum to learn about Civil War artifacts and to take pictures. The collection includes artifacts from the Civil War, First and Second World Wars, and medical items from the pioneering Myers family of doctors. Most visitors also want to see the famous Philippi mummies,” Alexander said. The Barbour County Historical Museum in the former B&O Railroad Station, is located at the East End of Philippi’s historic two-lane covered bridge in Philippi and is open 20 hours a week in season. 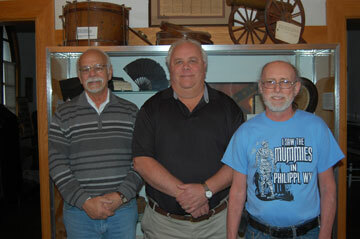 The museum depends on interested community members from whom the committee is currently seeking additional volunteers. Chairman Ed Larry may be reached at (304) 457-3773.